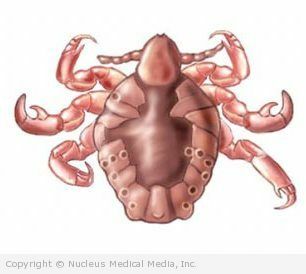 Crabs, or pubic lice, are tiny, barely visible parasites. They are usually found in the pubic hair but can also be found in other body areas with short hair. This may include eyelashes, eyebrows, armpits, and mustache. Pubic lice are commonly called crabs because they look like tiny crabs. Crab lice are parasites. Parasites are an insect that need to live off of another animal. Crab lice are spread by personal contact, usually during sexual activity. Less often, crab lice may also spread by sharing personal items. This can include sharing bedding, towels, and clothing. The doctor will ask about your symptoms and medical history. A physical exam will be performed. Your doctor will be able to diagnose crab lice by the appearance of lice and lice eggs in your pubic area. Your doctor may also check you for other sexually transmitted infections. Over-the-counter shampoo or cream rinse containing permethrin or pyrethrins are used to treat pubic lice. Lindane — a prescription topical medicine. NOTE: Lindane should only be prescribed to patients who are unable to take other medications or who have not responded to them. According to the Food and Drug Administration’s warning, lindane can rarely cause serious side effects, including seizure and death. Those especially susceptible are infants, the elderly, children and adults weighing under 110 lbs, and individuals with other skin conditions. It should also not be used in pregnant or lactating women or in people who have uncontrolled seizures. Lindane is a toxin and should not be overused. Patients are given small amounts (1-2 oz) of the shampoo or lotion and instructed to apply a very thin layer and not to reapply. Ivermectin — a medicine given by mouth. It cannot be used in pregnant or lactating women. Wash the infested area. Towel dry. Thoroughly saturate hair with lice medication. Follow the package instructions carefully. Leave the medicine in the hair for the recommended amount of time, not longer. Remove the medicine from the hair as instructed on the package. Following treatment, most lice eggs will still be attached to hair shafts. You can remove them with your fingernails or a comb. If you have lice in your eyebrows or eyelashes, you may be directed to coat the area with a prescription petroleum jelly. If only a few lice or eggs or present, it may be possible to remove these with a nit comb or your fingernails. Kill any lice and nits on clothing or bedding. Wash any items used during the 2-3 days before treatment. Use the hot water cycle (130°F) [54°C] of the washing machine. Use the hot cycle of the dryer to dry clothes. Avoid sexual activity until partners have been treated. If necessary, treat again in 7-10 days. Watch for signs of crabs, such as itching in the genital area. If you or someone in your house has had crabs, thoroughly wash and dry bedding, towels, clothing. If you have had crabs, inform any sexual partners that they are at risk for crabs, and avoid sexual activity until partners have been treated.